Handmade Jane: NEW YEAR, NEW GIVEAWAY! Hello! Love your blog, and I'm interested in both giveaways! Nice blog and I would love to be entered in both giveaways! Thank you! I would love to be entered in both giveaways. I just started following and I love your blog already! I'd love to be entered in both. Thanks! Hi, I'd love to be entered in both giveaways please! I LOVE LOVE LOVE Liberty fabrics! They're so beautiful! :) And I love that the model on the front of the book is 'wearing' a Diana camera! Thanks for organizing this giveaway... And have a fantastic, Happy New Year! I follow your blog and I've added you to my blog roll. I would love to be entered in your giveaway for the book. I love your blog, I've been quietly following for a while :-) I won't put my name forward for the giveaways as I'm just a wannabe sewer, me and neddles don't mix well ALAS, but just wanted to say thanks for the great reading in 2010 and Happy New Year! Love both the book and fabrics, the liberty prints are fab! 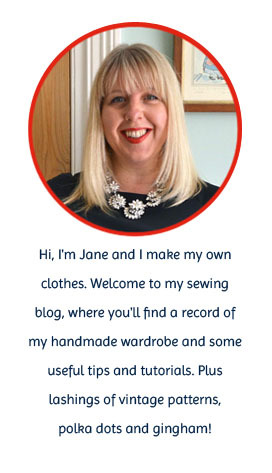 I'm following your blog and will add handmadejane to my blogroll too. I'm really enjoying your blog! Please could I be entered in your giveaways? I found your blog through Gertie's Crepe sew-along. I'm a loyal follower and would be thrilled to win either one of those prizes! Happy New Year! I'm a new follower and I'd be happy to win either. I am a follower and I would love to enter for he book, Hoping to sew alot for myself this year and it would be just the thing to help. I've been following you for awhile and cheering you on. I'd love a chance at the book as I love that blue jacket and well the blouse. . . It'd be fun to try designs from a new designer. Thank you and happy new year. I've just started blogging. Would love to be entered in both. Happy New Year! I just discovered your blog from sewretro. I would love to be entered in the draw for the book. Wow, thanks for putting on this great giveaway! The book looks awesome, but the fabric looks great too - please enter me for both! They are both lovely giveaways :) Could I have an entry in each please? Happy New Years. Would love a chance to win new book. Please enter me. Great blog. Hi there. Happy to become a follower and have a chance on the book. Happy sewing and happy new year! What a wonderful giveaway! The book looks brilliant, and I love the Liberty fabrics :) Hope you and yours have a wonderful new year! What a great giveaway! I'd be happy with the book or the fabric, thanks for the opportunity. I'm also about to tweet about this competition on twitter. Happy New Year! I love the book, and have looked at it a few times. The fabric is nice, but not something I would use, so just the book only please! Wow, that's a generous giveaway. Thank you for the chance! May I put my name down for the fat quarters? I would love to be part of both giveaways! your blog is really great. I would love to be in it for both giveaways! thanks! the skirt on the cover and loved it! Would love to have the book - or fabric. New follower. Found you through another blog. I would like to be entered into both. i just discovered your blog. Lovely! I have pledge that I will sew something every 10 days for 2011 and both of your gifts are perfect for it! Either giveaway is great - following you after this entry. What a great give away! I've thought about buying this book but that V&A fabric is lovely too. I'd like a chance to win both.Thanks! Great giveaway! Count me in for both! thanks a lot! Thank you. Everything looks lovely! Would love to win your book as I collect knitting and sewing books! Love those prints! And I'm *pretending* I'm a quilter at the moment! The fabric is gorgeous. Are you sure you want to give it away??!! I'd like to be entered into the draw for that please! Lovely Giveaway! I'd love to be entered in the draw for the fat quarters please! I would love to be entered in both prizes please. Thank you for this wonderful giveaway! I'm a follower and I'd love to be in both giveaways please :) That fabric is great!! I'm a follower. Your blog is lovely. Please enter me in both giveaways. Thanks and Happy New Year! Happy New Year Jane, what a generous and fabulous giveaway! I've been following your blog almost from the beginning, and as a novice sewer, get a lot of inspiration from you. I'd be delighted to have the chance to win either of the prizes on offer, thank you. would be great to be put in for both!!! Very exiting and love love love that book! Hi! I'd love to be entered for the book! I love the third photo. Good luck with your New Year's resolution:) I'm trying something similar-->no new clothing purchases for one year! Great giveaway. I'd like to be entered into the draw for both please! I love your blog: you're a very brave sewer compared to me! I'd love to be included in both giveaway draws. Happy New Year! Hi - I really like your blog which I found through Sew Retro. What a great giveaway, I would love either thing, I'm not fussy (ha ha). Nice giveaway - love the FQ's! I'm a new follower. I've also posted your giveaway on my blog, so would love another chance to win the bundle of fat quarters please! I would like to enter for both items please. Many thanks! Wow, I love both the fabric and the book. I'd love to be entered in both! Oooh! Please enter me in both. Thank you very much indeed! I'm interested in both! And I'm a new follower. I would love to be entered in both giveaways! I am a follower. I put your giveaway on my sidebar. Please enter me for both! I'm a new follower, thanks so much. I've blogged about the giveaway so I'd love another chance to win both, or either! Wow what a lovely blog. I would love to be entered fot the fat quarters, So pretty!!! What a great giveaway! I'm planning a baby quilt this year for a friend so those Liberty fat quarters would be put to good use! What a lovely giveaway. I just found your blog - love the clothes you are making. As for the ladylike dress - wear it anywhere you like. It's beautiful and as long as you feel good - who cares! Book please... :) I have been eyeing it for sometime in the local bookstore. I've seen that book before, and it would be a great addition to my library! I've just become a follower, and can't wait to read more! One more new follower, I found you via Elle's blog post (above). The Liberty print fat quarters look great, I'd use them as fun pocket and waist linings. Please enter me in the fabric draw. Thanks! I'm following and I facebooked about your blog...as I'm not currently blogging. I'd love the fabric, just gorgeous. 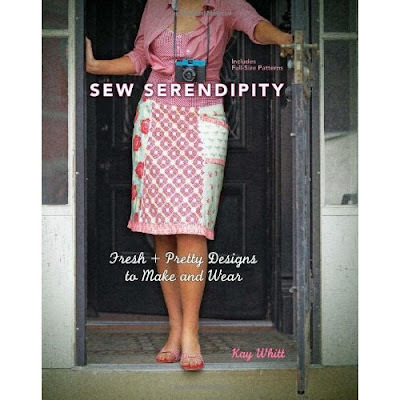 I have the Sew Serendipity book and it is truly gorgeous. Thanks for the chance! Lovely fabric, but what truly entices me is the book as I've had it on my wish list for awhile :D. By the way, found my way here via Elle's blog. can I enter both giveaways please?? I would love the book..Thanks for the giveaway!! Those fabrics are gorgeous, and that book sounds cool too. I just started sewing, and looking for some inspiration. Hi hope i havent missed out it all looks good.